The blockading of the U.S.-Mexico border was a relatively recent phenomenon. From 1848 until 1969 (121 years), the border between Mexico and the United States was a very open one. People from both sides came and went pretty much as they pleased. Inter-marriage, daily business commerce, and crisscrossing the border were common occurrences. So when former U.S. President Richard Nixon ordered that fences and barbed wire be installed to intercept and stop the “drug trade,” this was the beginning of the unilateral U.S. government’s war against illicit drugs and militarization of the border. Eventually, the law would also target Mexicans who were able before to go to and from the United States without interruption. Two things started to occur that would change the face of the border. 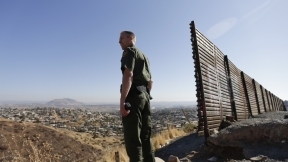 First, the U.S. militarization of the border in the name of fighting illicit drugs. The second was stopping the flow of Mexicans trying to escape the economic and social problems afflicting Mexico at the time (although, had the U.S. government left the border open, the chances are that those Mexicans who fled Mexico would have most probably gone back. This is what happened during the Mexican Revolution. During that period, many Mexicans fled into the United States. When the revolution ended and Mexico became stable again, most of those Mexicans who fled returned to Mexico). The policy that Nixon implemented became common practice for future U.S. presidents in regards to the U.S.-Mexico border. The U.S. government began to build more border fences and more barbed wire entanglements with watch towers and the U.S. Border Patrol running the length of the entire southern United States. The only possible change in this was the signing between the United States and Mexico of the North American Free Trade Agreement (NAFTA). But even with NAFTA, then U.S. President Bill Clinton also increased the border security between the U.S.-Mexico border, and this semi-military build-up has been happening ever since. On the one hand, Clinton tried to open the border for more trade, commerce and people-to-people exchange, but on the other hand he tried to close the border even further. Two contradictory policies running parallel to each other. In 2006, U.S. President George W. Bush signed the Secure Fence Act that saw the construction of the continuous border fence we see today. This project alone cost the United States $30 billion, and has shown itself to be largely ineffective. In other words, a completely waste of money. The cost of law enforcement along the U.S.-Mexico border has risen 590 percent from 1993, and the border is still nowhere near secure.